LureMaking.com's brass spinner bodies are the finest available. Each is machined out of solid marine grade brass, turned and perfectly balanced. 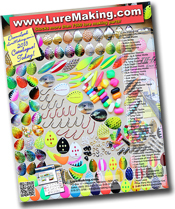 LureMaking.com has the largest selection of spinner bodies available in Canada. 14-11 K* - 3/16" 0.050" No Longer Available! * "K" body is no longer available! * "F" body is available in Nickel Plated Brass only! ** Available in Polished Brass Only!